Need new apps for your favorite device? Here are 58 iPhone, iPad and iPod touch apps that just hit the App Store. 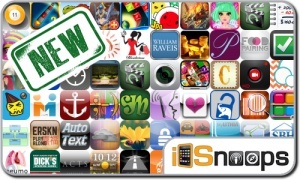 This new apps alert includes Celebrity Dress Up: Paparazzi, Avenger, Bongo Touch 2, Galaxy Quest, Castle Master Plus, Home Screen Designer Pro, Mystery Lighthouse 2, Cool Pool, iPoll, Foodpairing Explorer, and many others.